A lot of times if you’ve been doing something for a while, you tend to take things for granted. I got a call from a prospective client, someone I’ve known for several years. They called to ask me a question that I just figured everybody knew. I came to the conclusion that if they didn’t know the answer, most likely a signifigant portion of the readers don’t as well, so I’m going to take a minute and address some of the different ways you can get started buying stocks. To give you some background on the person that called, they were in a 401K so they were investing for their retirement, but they never actually had gone out to invest into individual stocks. There was a certain stock that they were hot on and thought that they could make some money on so they wanted to go buy it. I gave her a few different places that she could go to do her own research and buy the stock. If you are itching to invest your money, make sure to check out our great reviews on different ways to invest such as our Motif Investing Review. First, if you’re looking to buy stocks, make sure that you’ve got a foundation set. I always hate it when people call me and they want to start investing in individual stocks and yet they don’t have anything saved in retirement. They don’t have a 401K. They don’t have an IRA. They don’t have an emergency fund, yet they want to start investing and playing in the stock market. That’s one of my biggest pet peeves. It’s like a house, right? With a house, you have to build a foundation first. You don’t start putting on the roof or start doing the inner accessories like the big screen TV and the couches before you have the framework or foundation down. Make sure you have those in place first before you go out and start buying stocks. That’s my entry disclaimer, but I just wanted to get that out there first. Now if you’re ready to start buying stocks and you feel comfortable doing this, you have a couple different areas online you can go to. The first place you can go is any discount broker. Think E*TRADE, Ally, and I’m sure there are countless others, but these places are good. For starters, they’re very, very inexpensive. Sometimes you can open accounts for free. Then to execute the trade to actually buy the stock you may pay as little as $7.95 on up to 15 bucks per trade. That’s pretty reasonable, especially if you’re only going to be doing a few trades here and there. Some of them, and I’m not familiar with all the rules, but they may charge you an annual fee if you don’t do a lot of trading. Definitely read all the fine print and rules before you engage in buying stock from an online discount broker. If it’s something where you’re going to buy a few stocks here or there, that could be a viable option. Another option if you’re comfortable making the purchases online is to actually buy it through the company itself. One website that has a lot of arrangements with a lot of different companies is Computershare. When I have clients that have a share of stock that they either inherited or it was given to them, quite often computershare.com is the custodian. They will have to call them to liquidate it or to find out how many shares they own. Computershare just seems to be a common hub for a lot of these different companies. How I’ve recently had some more relationship with Computershare was I wanted to buy stock for my kids, not so much as an investment, but more of a keepsake. I wanted to buy a share, put my son’s name on it as in the form of a custodial account. They had the actual certificate, something we could frame and put it on the wall and have a keepsake. I was having difficulty trying to find a certain stock that I wanted to buy. Sure enough I went through Computershare and they had an arrangement with that company so I’ll be doing that soon. Computershare has a relationship with a lot of those companies. You can go to computershare.com and follow their links. I think you go to investor’s center and from there you can see some of the companies that they have an arrangement for. I think it’s over 500 companies. I’d have to check the website just to double check, but that’s another venue that you can go. I think it’s maybe a $15 transaction charge, so once again very minimal cost to do it. It’s another good, do-it-yourself, online arena where you can go to buy individual stocks. 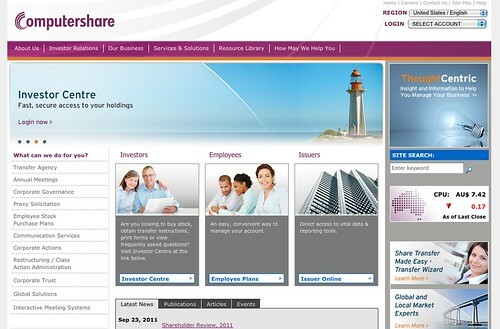 You can sometimes buy stock directly from the issuing company, without using a service like Computershare. This is mainly available with large, well-established companies. You can find out if the company offers the service by contacting their investor services department, which you can usually find on the company website. One of big advantages to this is that the companies typically don’t charge any transaction fees, so you can buy the stocks at cost. And some companies will even allow you to sell your shares back to the company. DRIPs. Some companies even offer programs known as Dividend ReInvestment Plans, commonly known as DRIPs. When you participate in this plan, your dividends are automatically reinvested in buying additional shares of the company stock. This is a way to build a long term position in a company that you are committed to holding an investment position in for a very long time. If you want to invest in the stock market, but you aren’t comfortable doing it with individual stocks, you can invest in a large number of stocks with a single investment in a mutual fund or an ETF. Yet another advantage to investing in funds is that you can buy and sell them just as easily as you can trade individual stocks. You can buy them through a discount brokerage firm, as listed above. But you can also buy them through mutual fund families, such as Vanguard and Fidelity. Those are two of the largest mutual fund companies, but there are dozens of others to choose from. Fund Families. Buying direct through a fund company – sometimes referred to as a “fund family” – is often less expensive than buying through a discount brokerage firm. That’s because within the fund family there are typically no transaction costs. Index Funds vs. Actively Managed Funds. There are two general types of funds to be aware of, index funds and actively managed funds. Index funds invest in established investment indexes, such as the S&P 500. Index funds are more typical for ETFs. Since they invest in an index, the individual securities within the portfolio are traded only when the composition of the index changes. Since that is a relatively rare event, index funds have very little stock turnover, which means that their investment expenses within the fund are very low. Actively managed funds are typically mutual funds. They tend trade a lot more than index funds, and have higher investment expenses. For this reason, index funds often outperform actively managed funds, and are probably the better choice for most investors. Load Fees. You should also be aware that funds sometimes charge what are known as “load fees”. These are one time fees that are built into the fund, and they generally range between 1% and 3% of the value of the fund you’re purchasing. They can be charged upfront (known as front end loads) or upon sale (backend loads), and sometimes both on some funds. Loads are high, which is why you should favor no-load funds. Not only are they less expensive to buy, but you’ll feel more freedom to close out your position whenever you choose, if you are not concerned by how much money you paid upfront in order to buy the fund in the first place. If you want to invest in the stock market, but you aren’t comfortable doing it with individual stocks, or if you are unsure as to which mutual funds or ETFs to buy, you have one more option. A group of online, automated investment platforms have developed in recent years, commonly known as robo advisors. These are investment platforms that will manage your investment portfolio for you, and do so for a lot less than the 1% to 2% annual fees that human investment advisors charge. You set your allocation with the robo advisor – which they take care of for you – then your money is automatically managed and invested by the platform. You’re only responsibility is to fund your account. There are now dozens of robo advisors available, but one of the most popular – and well-regarded – is Betterment. They will provide professional management for your investments, for a fee of between 0.15% to 0.35% per year. See my full review of Betterment for more details. Okay, if you still want to buy stocks and you’re not completely comfortable going online to do it, I don’t blame you. That can be intimidating for a lot of people. You have to open up an account online and send some money to some faceless operation. The other option you have is you could go to a local investment house, local stockbroker and buy stock through them. Just so you know, by going that direction you’re probably going to pay more, considerably more, but at least you have a face of someone you can talk to. They can share their expertise of what you think is going to make you a lot of money, if it really is. Also, you have somebody that hopefully is going to educate you in having that foundation set. All these different brokerage firms differ on their prices, but I have to think at minimum you’re going to be spending about $40 per transaction. So if you buy a certain number of shares it’s 40 bucks. If you sell again it’s another $40. That’s for a smaller amount transaction. The higher transaction you go, the more shares you buy, or the higher the share price is will then determine how much the commission is going to be. Some of these firms as well, if you don’t trade frequently, are going to hit you with either a small account fee or an inactivity fee. Be conscious of that. It’s definitely not the cheapest direction to go. Typically, when I’m working with clients and if they want to do some stock trades or they have a younger relative or their kid that wants to buy shares of stock and that’s all they want to do, I usually will guide them to one of these online platforms if they are comfortable just to help save them a few bucks. and just give them some stock, maybe the stock you’re interested in, just to see what it is and how much the fee is going to be. You want to make sure you know what you’re getting yourself into. Make sure you read the fine print before you proceed and make that initial investment. In fact, most people don’t know enough to pick out good mutual funds or know whether they should be invested in their company 301k, let alone individual stocks. Think of all those people at Enron! Buying individual stock (and often mutual funds other than the general index funds) is at best partially speculative. It is safer to keep your basic investing in a solid Roth IRA and look at any other investing as a fun game with extra money. More people DEFINITELY need to hear this. I have many friends who do exactly what you mentioned. They buy a stock because their aunt or uncle or lawyer told them it’s a good company to own….they made 40% over the last few months…and they tell them to get in now as the price is just going to keep on going up. People need to use more common sense when it comes to investing. The same way you wouldn’t jump into the deep end if you don’t know how to swim is the same way you shouldn’t jump right into stocks if you don’t know how to invest. Everyone wants to hit the home run without going through batting practice. It just doesn’t work that way in life or with investing. Do your research. Become familiar. Review the company’s Income Statement & Balance sheet. If you want the truth. It’s all in the numbers right there for you. With that information, you’ll be well equipped to make an informed decision. It’s so great to see that investors have a wider range of opportunities these days because of the emergence of the Internet and other technologies. Investing without a broker has its advantages and is definitely well worth it if you know what you are doing. Thanks for the post. It made me stop to think “hey, I can invest in an IRA through my bank…maybe they can help me buy stocks too” Yup. They can.